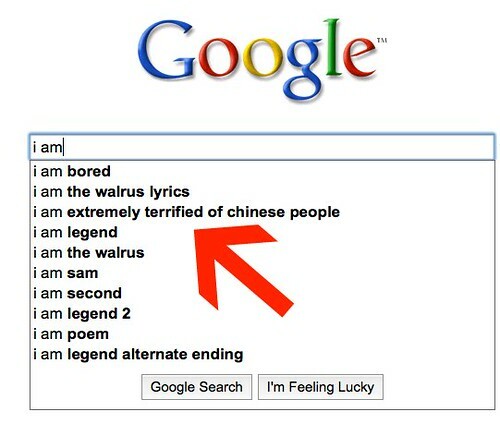 Google Suggest: "I Am Extremely Terrified Of Chinese People"
Home > Google News > Google Suggest: "I Am Extremely Terrified Of Chinese People"
If you go to Google.com and just type in [I am] Google will then offer as the third suggestion, "I Am Extremely Terrified Of Chinese People" as a search suggestion. This is not new, it was reported back in February. But back then, you had to type in [I am extremely] to get this search suggestion, now all you need is [I am] to return the search suggestion. Yes, Google's search suggestions are completely algorithmic. But Google has been known to remove search suggestions - unlike their policy for not removing search results.